2017 Gibson Historic 1959/R9 Les Paul, New w/ COA/OHSC, Tiger Flame! This is a brand new Left Handed Gibson R9 Les Paul from December 2017 with one of the more attractive tops I’ve had over the years. The top reminds me of Billy Gibbons’ Pearly Gates 59. 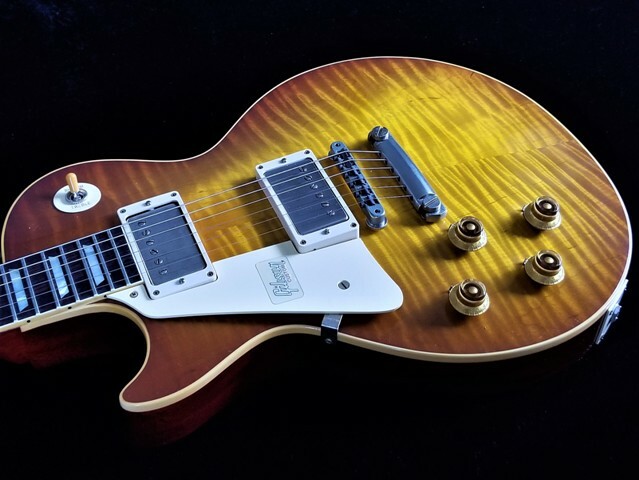 It also looks like the 59 Burst featured at the top of the Les Paul Forum home page. It is a strong curly maple top with wide Tiger flame and striking 3-D movement from any angle or light. It is hard to find a top like this – I’ve had close to 50 R9s over the years, and this is one of the best I’ve seen! The finish is VOS Ice Tea, the hardware is Nickel, the weight is very desirable for a Les Paul at 8 lbs, 6 oz, and the neck profile is reminiscent of a mid-59 Burst with .89/1st fret and 1.00/12th fret. I also set up the guitar with 4/64/Hi E and 5/64/Low E at the 12th fret. Here’s another amazing thing about this guitar: the clearance of the strings over the Tune-O-Matic bridge was good with the stop tailpiece clamped down – something that I rarely see with Les Pauls and provides maximum sustain! This Les Paul has it all – it’s truly a special R9! Includes all tags/paperwork with COA and OHSC. Alex – sorry I have not been able to get back to you. But the guitar is great, came well shipped and no damage. Thank you very much for everything you did and helping me to acquire the instrument. If anything interesting comes your way, I’m always available to take a look. The guitar arrived in excellent condition, no issues whatsoever! 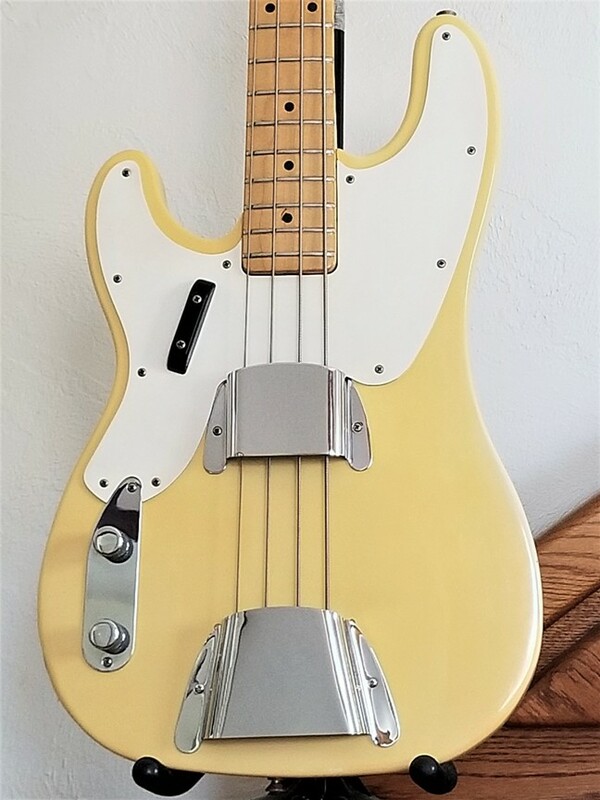 Great looking guitar! Will give it a test upcoming weekend. Everything is great with the LP Special! The guitar looks and sounds killer. Great setup and the frets are in better shape than I was expecting for a 60 year old guitar. Thanks again for all your attention in getting this guitar into my hands. Hi Alex ! Wow, exactly the one that I’ve dreamed of ! Thank you very much for your help, without you it would have been impossible. I’m so happy and proud !!!!! And thank you for the sending, it was really well packed 😻😻😻❤️ ! Can’t wait to really try it with an AMP !!!!! WOW!!! I mean I’ve got a hell of a collection, but this one… WOW!!! This may actually be The One for me. 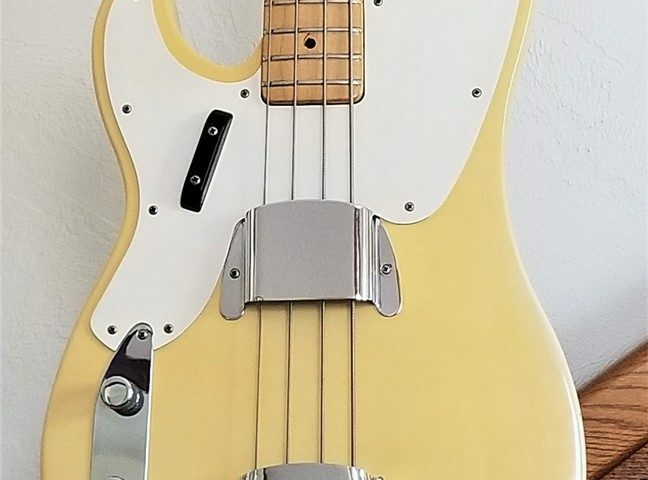 Its the TOTAL Package: Tone, touch, balance and beauty! It is stellar! The guitar arrived safely this week . 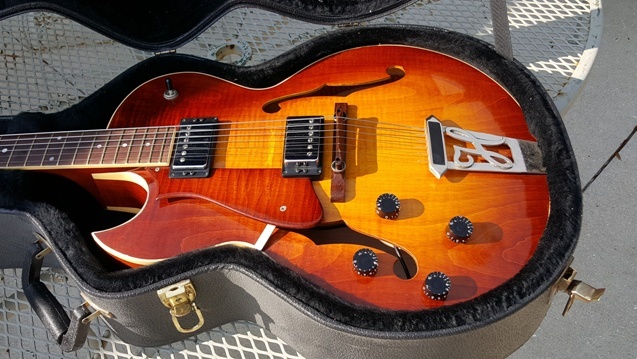 I put a set of 13s on it, and it plays and sounds great….one of the most balanced archtops I’ve played. Setup out of the gate was perfect – I did not need to adjust a thing aside from the action. Kudos to your luthier for the fantastic setup, and thanks again for the great guitar.